Anyone who has ever been in or near the water must have at some point had an epiphany about how we are connected not just to our water brethren but all living creatures. It may be basic Ecology but I believe it is intuitive to all of us. It's sometimes easier to relate to more accessible land creatures but our seas are in dire need of our help. I have been both fortunate and unfortunate to travel the globe and witness first hand both the rare magnificence of life as well as the unbearably tragic destruction that man wreaks on our fellow life forces. In the short film below from PETA, acting power house Joaquin Phoenix who can currently be seen on screen in the marvellous BAFTA nominated The Master - dramatically asks for some consideration for sea life. The short is shot by nature and celebrity photographer Michael Muller. Amongst the many posters Muller has shot he did the photography for Joaquin Phoenix's I'm Still Here. Whilst the PETA Drowning campaign is calling for Vegan-ism but my Hypocrisy knows no bounds for the sake of transparency I am a foodie through and through and despite scientific evidence telling us that our bodies are not adapted to eat animals I continue to eat meat but only line caught fish. Far fewer people will sea this clip as ABC decided against airing it during the broadcast of the other awards show - The Oscars. 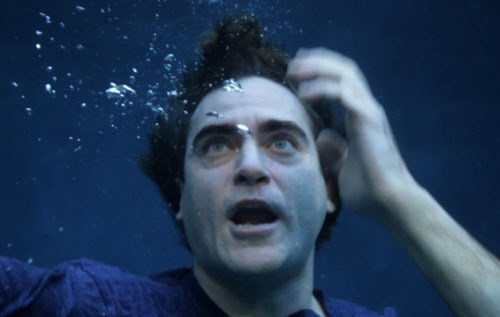 Joaquin Phoenix is drowning. In a rare appearance outside his award-winning films, the Oscar nominee is featured in a brand-new PETA UK video that shows him underwater, struggling to breathe and panicking. As the text explains, "In water, humans drown just as fish suffocate on land. It's slow and painful and frightening. … Put yourself in their place. Try to relate. Go vegan". The video, which was shot by top photographer Michael Muller, is available here. Capitalizing on the buzz surrounding Phoenix's critically acclaimed performance in The Master, PETA US moved to place the ad during the Academy Awards, but US television network ABC deemed the video to be too political and controversial to run during the broadcast. "I was 3 years old – to this day it is a vivid memory" Joaquin Phoenix says of the moment he connected human and animal suffering. "My family and I were on a boat, catching fish. As one fish was caught, he was writhing, then he was thrown against the side of the boat. You couldn't disguise what it was. This was what we did to animals to eat them. The animal went from a living, vibrant creature fighting for life to a violent death. I recognised it, as did my brothers and sisters." Biologists have found that fish develop relationships with each other and even grieve when their companions die. Some fish are capable of using tools, while others gather information by eavesdropping. These intelligent, sensitive animals are so good-natured that Dr Sylvia Earle, the world's leading marine biologist, said, "I wouldn't deliberately eat a grouper any more than I'd eat a cocker spaniel". In addition to garnering an Academy Award nomination, Phoenix's work in The Master landed him a BAFTA nomination as well as an award from the Venice Film Festival. For more information and to view the video, please visit PETA.org.uk or YouTube here.